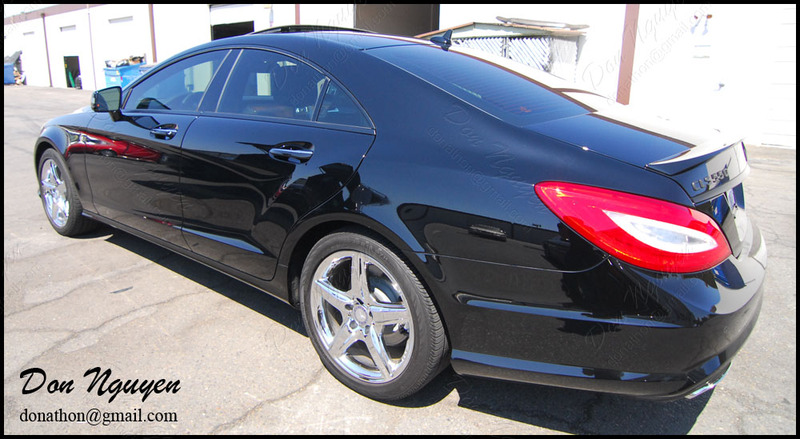 I blacked out the chrome/brush aluminum trim on this black Mercedes Benz CLS550 with my matte black vinyl material. We went with the matte black finish over the gloss black finish to give it some more contrast and a somewhat more of an aggressive look. I think it overall went fairly well with the look of the car. The owner of this car drove out to me in Anaheim Hills/Orange County to have the work done. In addition the window trim, I also did the rear trunk bar that was chrome, which tied in nicely with the blacked out badges/emblems that were on the trunk as well. Only other thing that I could have possibly suggested is to also lightly tint the clear portion of his tail lights.